Help the Bruma guard close an Oblivion Gate just outside the city. Martin informs you that Jauffre wishes to speak to you. Learn from Jauffre that he wants you to help the Bruma guard learn how to close an Oblivion Gate. Find Captain Burd outside the gates of Bruma and lead the charge into the gate. Make your way to the top of the Sigil Keep and find the Sigil Key. Enter the Sigillum Sanguis and disable the portal. Speak to Captain Burd again who will inform you that he no longer requires your assistance. Return with the news of your success to Jauffre. Jauffre wants you to accompany the Bruma guard as they learn how to close an Oblivion Gate, as one has conveniently opened just outside. Find Captain Burd outside the gates of Bruma and repel the first wave of attackers. You are then to lead the charge into the gate in order to close it. Lead Captain Burd and his two men (whom he calls Bor and Soren) in after a short inspirational speech. You can enter the gate without Burd and his men. Once you get to the top of the Fury Spike, your journal will update, telling you to show Burd how to close the Oblivion Gate using the Sigil Stone. If you use the wait command, Burd will soon appear before you and the quest goes on as normal. This Oblivion area has few things of significance, as it's mostly a winding, linear path to the tower. You may find a lone guard fighting daedra along the way. You may enlist his help or order him to flee. 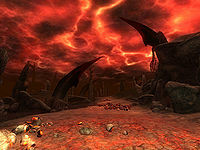 There are various daedra scattered about along with some treasure and plants. Once you reach the tower, go inside and make your way to the top. The guards will likely be of good assistance to you providing you can keep them alive. Burd is flagged as essential so he will only become unconscious. Your companions will charge an enemy as soon as it spots you or you attack it. Rest in safe areas to heal the guards as needed. They will also tend to get in the way of your attacks but don't seem to mind being hit a time or two (Warning: If you hit them a third time, they will turn on you. Simply yield to them and they should stop attacking). If you land the killing blow on a guard, you will receive the usual bounty of 1000 gold for murder, but the remaining guards will not try to arrest you until you come back to Bruma. Your disposition with Burd will also fall to zero. Near the top of the Sigil Keep, you will encounter a Dremora Sigil Keeper (he is no tougher than the daedra you have already encountered). Take the Sigil Key from him or pick the lock on the door that leads to the Sigillum Sanguis. Be warned that there is a small concentration of daedra guarding the Sigil Stone. Note that if you brought Burd into the gate with you, he must be present in the Sigillum Sanguis for you to remove the stone. If you told him to wait or left him far behind, you will have to go back and find him. Once the gate has been closed and you are back in Bruma, talk to Captain Burd again. He says that he thinks he can handle any more gates that open around Bruma. Return with the news of your success to Jauffre. Speak to Jauffre for an optional sidequest (Allies for Bruma), or speak to Martin to continue with the main quest line. When you recover the Sigil Stone, nothing may happen. ? The only way of continuing the quest is by opening the console and typing CloseCurrentOblivionGate. Entering the Oblivion Gate from the back (the side not facing where Captain Burd is initially waiting for you) may cause Captain Burd to not follow you into the gate. To solve this, just hit Burd until he attacks you, run to the Sigil Stone, and then yield to him. It is possible for Burd to fall into the lava or the column of fire in the middle of the Fury Spike. Because these cause continuous damage, Burd becomes permanently unconscious and it is impossible to get him to the Sigillum Sanguis. Travel back to Bruma and wait for Burd to respawn (This takes about 73 in game hours). Then when you enter back through the gate Burd will be waiting for you. On PC, you can bring up the console and use the command prid 36264 (or just use your mouse to click on Burd) followed by MoveTo Player. Use the console command CloseCurrentOblivionGate. The red Oblivion sky may turn into "ordinary" sky, following ordinary day/night cycles, while inside the Gate. ? Burd may randomly decide to remove his armor and wear his normal high-class outfit. Due an issue with the GetDistance script function, stage 35 of the quest may not be triggered, resulting in several disabled objects and actors outside the gate near Bruma not be re-enabled until the Great Gate quest has been completed. ? 10 Martin told me that Jauffre needs to speak to me. 20 Jauffre told me that an Oblivion Gate has opened near Bruma, and the Countess has asked for the Blades to help her guardsmen close it. I should find Captain Burd outside the city walls and help him close the Gate. 30 Captain Burd and his men are ready to help me close the Oblivion Gate. I just need to let Burd know when I'm ready. 31 Captain Burd and his men are heading into the Oblivion Gate with me. I need to accompany Burd to the Sigil Stone chamber of the Oblivion Gate and show him how to close it. 35 Captain Burd and I have entered the Oblivion Gate. I need to accompany him to the sigil stone and show him how to close the Gate. 38 I've reached the Sigil Stone. Now I need to bring Captain Burd here and show him how to close an Oblivion Gate. 40 Burd and I have reached the Sigil Stone chamber. Now to close the Gate. 50 I closed the Gate with Captain Burd. I should ask him if he needs any more help from me. 55 Captain Burd thanked me for my help, and said that he and his guardsmen will do their best to close any new Oblivion Gates that open near Bruma. I should report my success to Jauffre. 60 Jauffre was pleased to hear of my success helping the Bruma Guard close the Oblivion Gate. It is possible to use the console to advance through the quest by entering setstage MQ10 stage, where stage is the number of the stage you wish to complete. It is not possible to un-complete (i.e. go back) quest stages. See SetStage for more information. This page was last modified on 2 January 2019, at 03:19.